Strategies for the Synthesis of Octaalkylporphyrin Systems. Cyclizations of a,c-Biladiene Salts to Give Porphyrins and Their Derivatives. Reactivity and Functionalization of b-Substituted Porphyrins and Chlorins. University of Houston, Texas, U.S.A.
@qu: "The first 10 volumes in this series won an Award for Excellence in Professional/Scholarly Publishing for 1999 by the Association of American Publishers, Professional and Scholarly Division, in the Chemistry category". @qu: "This valuable series gathers together world-renowned experts in porphyrin research to discuss the chemistry, physics, biology, and medicine of porphyrins and related macrocycles." 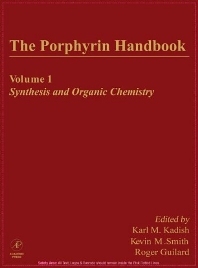 @source: Journal of the American Chemical Society @qu: "I have, at times, had people lined up to get at my volumes of The Porphyrin Handbook. Quite popular. People I don't know wander in to take a look and some hang around for quite a while. I put a couch in a public area outside my office to handle the traffic." @source: Professor Thomas L. Poulos, University of California, Irvine.